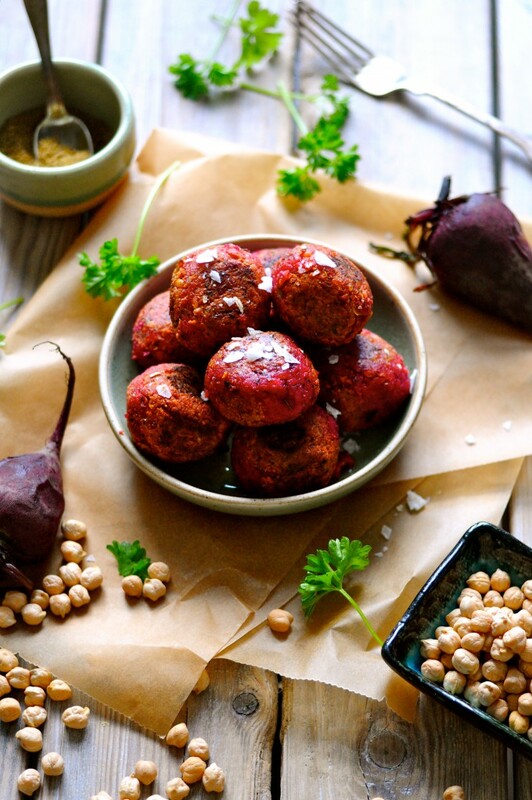 Here is my Nordic twist on a classic Middel Eastern dish – beetroot falafels! Isn’t the color just great? I think they are the cutest little beauties that look so great on the plate together with a nice and crispy green salad. Right now you can get the best organic beetroots at my local food market and I always have to buy some whenever I stop by. I simply just love beetroots and I use them in so many different recipes. 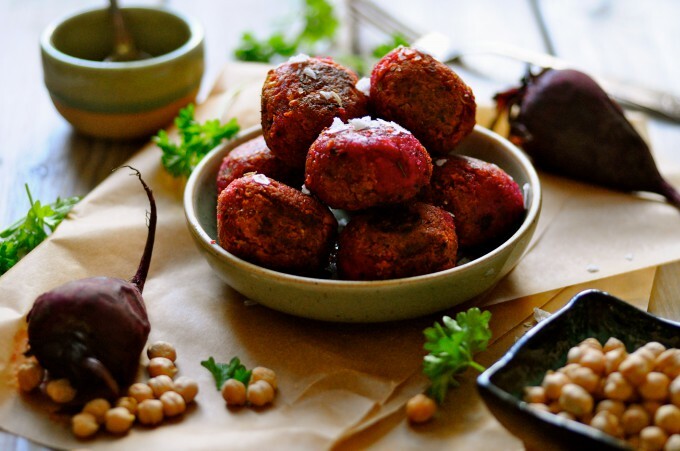 My favorite ways of using them, besides these falafels of course, are in a salad with fresh herbs, lemon zest, red chili and last but not least plenty of feta cheese made from sheep’s milk. Did you know that you can also get striped beets? In my opinion they are some of the most beautiful veggies you can find. Try and google them! I’ll tell you they look almost like candy and their taste is perfect without being too sweet. If you fancy a beetroot salad with or without the striped beets take a look at this healthy beetroot salad recipe. It might give you some inspiration. I enjoyed these beetroot falafels with some whole grain tortillas made from rye flour and some crispy green salad and a nice yoghurt dressing with grated cucumber, garlic and lots of freshly ground pepper. You can also put them in a pita bread or just eat them as they are, plain and simple – they are that good! Blend chickpeas in a food processor with all the ingredients until you have a cohesive mass, from which you can make falafels. If it seems too dry, add some more olive oil and if you think that it is too moist, add some more chickpea flour. Shape the mixture into small falafels and fry them in a pan with plenty of olive oil over high heat on both sides. 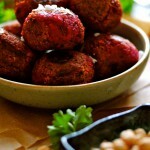 Mmmm, beet root falafals! Rye pita! This sounds amazing! 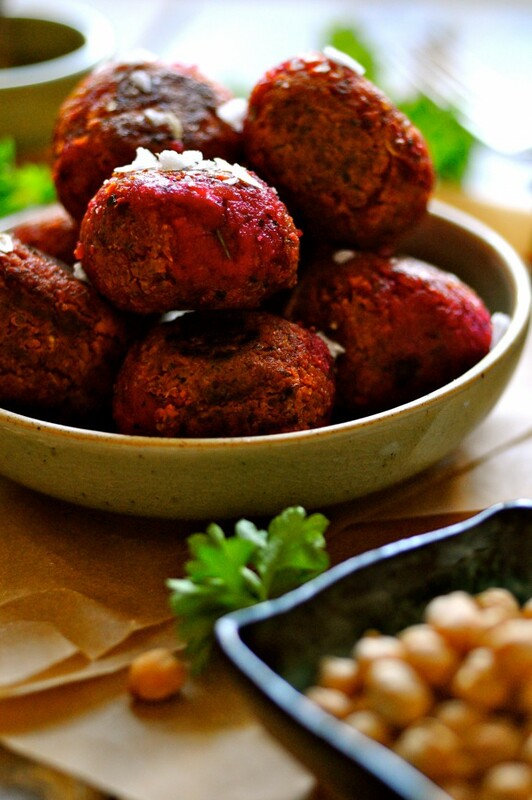 I haven’t made my own falafal in ages, but these are clearly inspiration to try again. And I love striped beets, pretty much the most beautiful thing there is. Thanks for a fabulous recipe, I now know what my weekend project will be! 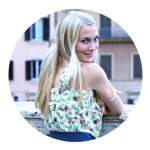 Hi Katie, You’re welcome! Anytime : ) Yeah, beet root falafels and rye pita are the best!